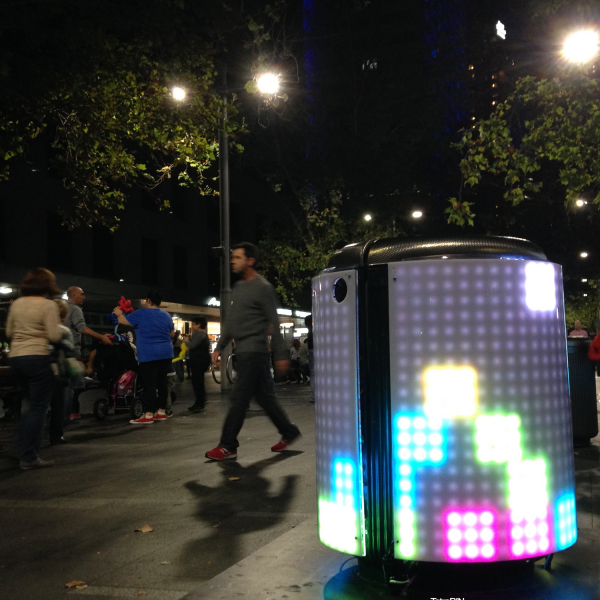 TetraBIN explores how innovative digital technologies can be used to motivate positive change in urban environments. In particular it tackles the problem of littering by associating the act of rubbish disposal with a fun and rewarding activity. The act of putting rubbish into a bin is turned into a game, where a piece of rubbish is mapped to an interaction within a game world displayed on a computer controlled screen surrounding the bin. Depositing of rubbish into a bin, which is normally seen as an insignificant act requiring minimum thought is given importance as the participant must drop their rubbish into the bin at the right moment to advance further in the game. This experience of an augmented reality in which actions in the real world affect the virtual world lead the participant to consider environmental issues facing the city, specifically the collection and management of waste. TetraBIN team has three members, Steven Bai, Sam Johnson and Martin Tomitsch. Steven Bai and Sam Johnson are recent graduates of the Bachelor of Design Computing at the University of Sydney. During their studies, their creative projects included designing an animated data visualisation for the University of Sydney’s donation campaign, and a mobile exhibition guide for which they received a design award sponsored by BlackBerry Australia. Encouraging a sustained change in people’s everyday behaviour was our ultimate goal when we just started exploring a rubbish idea to design interactive bins. “What if the bins in the street are somehow joyful to interact with?” We asked ourselves, when brainstorming the potentials of how the bin can be augmented with nowadays’ technologies. “It would be more meaningful if we could persuade people to contribute to the environment by making the process of rubbish disposal more fun”, re-envisioned the inspirational concept of our design led us to redefine what functionalities urban furniture can provide to enhance people’s experience in a public space. 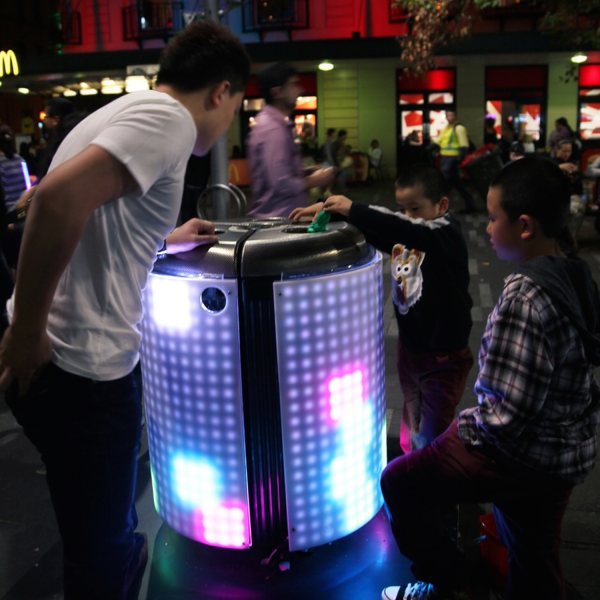 TetraBIN uses gamified approaches - making use of game mechanics and game thinking - turn an activity traditionally considered trivial, such as depositing rubbish into a bin, into a joyful event. These approaches are designed to enhance the experience of interacting with urban furniture, with the goal of encouraging more active attitudes from people formerly partaking passively in a relatively insignificant activity. Reminiscent of 8-bit era video games, players collaboratively control light blocks on the screen by timing when the rubbish is dropped into the bin and depositing rubbish of varying shapes and sizes. The pattern of constantly circling blocks encourages interaction with the bin. TetraBIN addresses the appraisal of interactivity and engagement in the emerging physical world of ubiquitous computing with an emphasis on usability and environmental awareness. It illustrates how urban furniture can be augmented with interactive technologies, with the goals of creating and bolstering joyful interventions and interactions in the city. The work utilises the latest in LED media façade technology. To be more specific, we custom-produced the displays covering the circular surface of the type of bin that is being used in the City of Sydney. Each display consisted of 900 LEDs that were manually mounted onto laser-cut Perspex and covered with a translucent layer of polycarbonate. Three pairs of our custom-developed infrared sensors per bin were used to recognise rubbish being put into the bin. We wrote code to translate the sensors' signal into visual patterns that correspondent with the algorithms. 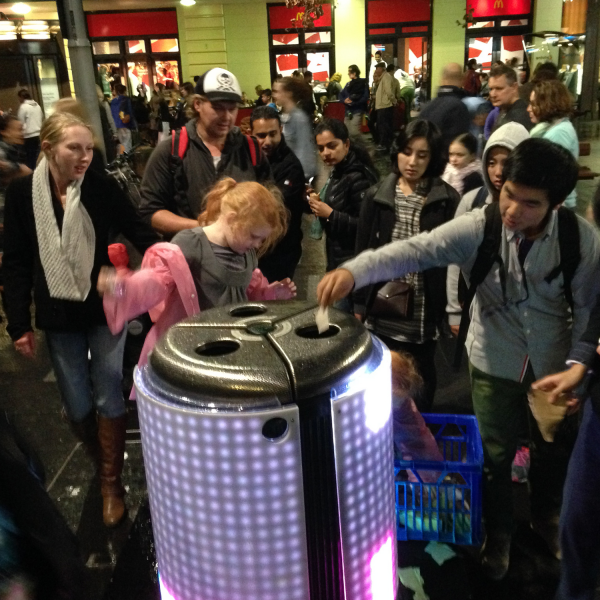 We installed two TetraBINs as part of a large festival in Sydney (Vivid Sydney 2014) and observed people interacting with our installation over a period of 18 days. Generally speaking, the audience were extremely engaged with TetraBIN regardless of their age groups. There were at least 10 thousands people interacting with the bin every night during the festival. We gathered a number of interesting observations regarding the game mechanics and the concept of transforming the familiar appearance of a bin through an interactive light display. For example, we observed that due to the short interactions people would have with the intervention, many people actually attempted to complete entire rows, which was the original aim of the game. Also people invented different ways of playing games on the spot, such as stacking blocks of certain colours on top of each other. One of the most memorable comments came from a child when he was shouting to his dad “Daddy look! I’ve cleaned the bin”, while witnessing the TetraBIN screen fades to white. This phenomenon represents a younger group of children who see the game elements differently because they possible never come across the vintage style 8-bit games. TetraBIN reuse the LED lighting modules from previous projects and all other electronic components are able to be reused in the future as well. TetraBIN's raises people's environmental sustainable awareness by motivating more positive urban behaviours from them, it uses gamified methodologies to re-envision the way people see the activity of rubbish disposal. These gamified methodologies reinforce the association between people and the bin by augmenting the latter to encourage playful and rewarding urban interactions. This award celebrates innovative and creative design for a temporary building, interior, exhibition, fixture or interactive element. Consideration given to materials, finishes, signage and experience.